This film was released in 1965, and is now on general release in the UK on DVD. As it deals with the events of 1876, it seems reasonable to review it for the CAGB website. I first saw the film just after it was released; watching it again recently, I found that my views of it have changed over the years. The basic stuff is that it was directed by Arnold Laven, in a rather (at times) sub-Fordian and ponderous way. 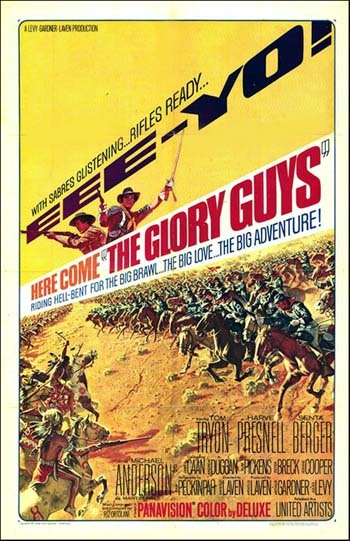 But the film script was written by Sam Peckinpah, at a time when he had already directed a couple of classic westerns. So why was he writing instead of directing? There seems to be ample evidence that Laven and Peckinpah were not of one mind. To misquote from other fields it is a film ‘of two halves’ – but sadly the two do not fit together. There is the conventional story of two men fighting over a woman and then there is the much better story of the Indian campaign. The leading characters are played by a trio of rather wooden actors, who seem to find it hard to get out of the sixties and back into the 1870s. They are Tom Tryon as Demas Harrod (essentially Benteen), Harve Presnall as a scout and Senta Berger as the female object of their interest. This storyline takes up most of the first half of the film and then fades away as the more interesting events unfold. Their competition for the woman is never resolved, as Harve is killed, whilst fetching water from 'Reno' Hill. We must assume that this leaves the way open for Tom. But we never see a meeting between Tom and Senta after the battle and the subject is not mentioned. There is a (supposedly) comedy fight between the suitors, in Miss Berger’s house, which succeeds in wrecking most of it. Would this endear them to a women living on the frontier? Of course, by the time of Harve’s death at the hands of the Sioux they recognise each other for the good chaps that they are. I acknowledge that these are the usual activities for a western. But the handling of this aspect of the film is heavy handed. 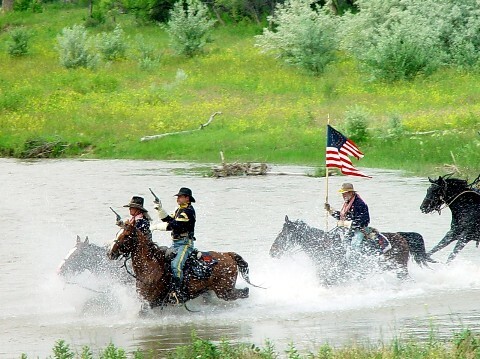 The second half of the film is much better: the campaign and the battle at the 'Little Bighorn'. That is not to say that the experts among you will not spend many happy hours picking holes in the representation, but it is a film after all. Here I feel that the hand of Peckinpah is much more apparent with some pointers to his later films. The battle is handled quite well, though events are compressed. For example the Major and Harrod do not get involved as two separate groups. Tom and Harve are the water carriers. And so on, but still it is worth a look. It is not a classic, which may explain why it has taken so long to appear on DVD. One for the completists among you.